Nikos was a very kind host who helped us where he could. He was always here for us and even picked us up from the port and brought us back. The location is good and you can have a great relax at the pool! Can highly recommend. Thank you for the stay Nikos! Had a great time at Nikos place, he picked us up at the airport and also brought us to the port when we left. 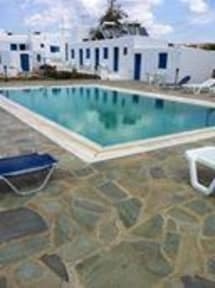 There is a pool and the bus station (2 busses per hour) to the most beaches are close by also you can have a short walk to the city in the evening.